You are cordially invited to participate in what is sure to be the event of the season, The Legacy Weekend. 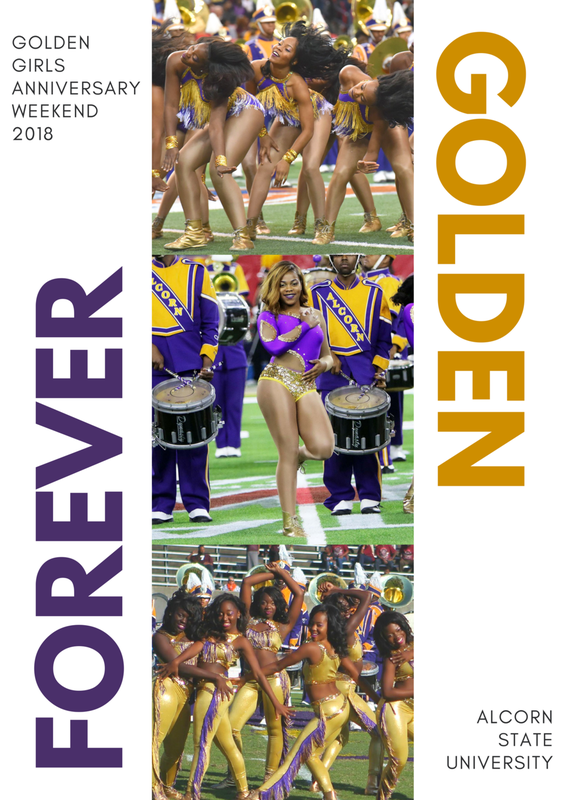 The Alcorn State University Golden Girls, the first and the finest of all dance teams, are celebrating 50 years of sisterhood, friendship and a whole lot of dance. As a member of our esteemed team, we would love to have you in attendance as we spend Homecoming 2018 weekend celebrating our legacy, lineage and more. We have two full days of events planned that you absolutely do not want to miss! All details and information are on this page, so keep scrolling! A portion ($50) of the participation fee will pay for vendor services and/or supplies needed for the weekend of celebratory events. The remainder ($50) of the participation fee will be donated to the 2018-2019 Golden Girl Dance Line. An official presentation of the donation will be made to Dr. Murray at some point that weekend. The participation fee is currently $125. The absolute last date to pay is July 31st. Please remember, you must pay the fee to be included in the Halftime Performance if you are dancing. Your registration will not be marked complete until you have paid full. Please fill out and submit the attached form. Once your form is completed you will be provided payment information. Note: If you would like to pay by mail/check, please fill out the form, and further details will be provided to you. I am ready to pay! For more details, specific room block information, guest room rates and more please click here.